Remote data analysis and visualization is a new trend in data analytics. It’s come about with the easy availability and use of high-performance computing and big data analytics tools such as MapR™ and Apache Drill®, cloud computing and increasingly powerful graphics visualization software such as TIBCO™ Spotfire®. Business users have been using these tools for a while. Now, scientists and engineers are using these capabilities to analyze and communicate complex phenomena and environments that are too difficult or dangerous to approach or describe close up. Using remote visualization tools such as Spotfire and Hadoop-based analytics tools such as MapR greatly improves the quality and speed of analysis. It also reduces capital and operations costs and improves scientists’ analytical and visualization capabilities. Why remote operations? When scientists analyze and visualize large data sets, remote operation eliminates many data management problems. Data transfers, especially large results files, can choke internal networks and cost a fortune. It’s much easier to move the code to the data, so that’s what meteorologists, oceanographers and other scientists do. Big data and HPC. Incoming data floods storage hardware and operations. Processing, analyzing, and visualizing these terabytes of data becomes more and more difficult. The algorithms, software, and hardware we use are not scaling as fast as our acquisition systems. Apache Drill and MapR support machine learning and natural language capabilities that can process huge datasets quickly and accurately. Cloud computing. Datasets are becoming too big for easy use in the computers we use every day. A huge, multi-terabytes dataset has to be stored in a computer, a network drive, or in the cloud. It’s just too big to analyze and visualize it on a workstation. Data transfers at this scale come at a huge cost. It’s much less expensive to bring code to the data rather than the other way around. In terms of visualization, this implies that scalable solutions have to be distributed. That makes remote data access for analysis and visualization a requirement. Graphics processing units. Thanks to the video game industry, graphics processing units (GPUs) are often the most powerful processor in a computer. In scientific applications, using GPUs to visualize data is nothing new. But now, the rich images that appear on screen represent an x-fold increase in processing power. When used together, these technologies provide a more efficient, cost-effective way to describe and share complex, sometimes amazing images and data of the natural world. 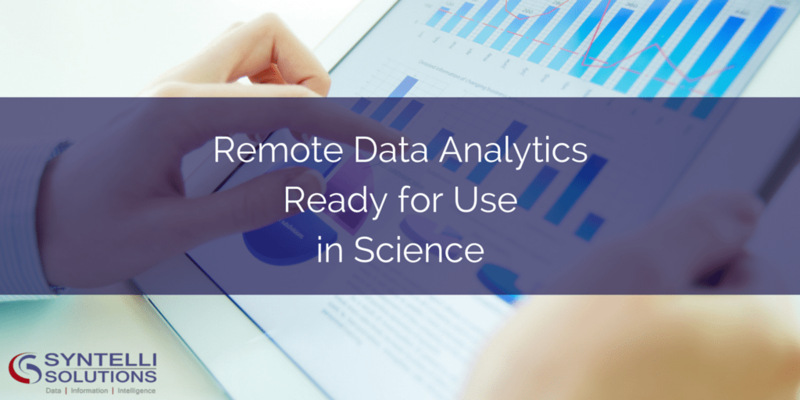 Next Time: We describe exciting applications of remote big data analytics in the sciences. If you’re as excited about remote data analytics as we are, we have good news. For a limited time, we’re offering a Big Data Test Drive. It’s our way to introduce our new, remote data analytics service. We know how easy it is to get lost in the technology of big data. We want you to be engulfed in its benefits, instead. So, we’ve designed a new service that eliminates the need for you to create your own data analytics environment. The Test Drive provides a remote computing environment, which includes fully configured MapR, Apache Drill and TIBCO Spotfire software as a service. This system is pre-built and ready to go. There’s no downloading or configuration to delay you from extracting value from big data technologies. Uses Amazon Web Services to provide a 100% in-the-cloud environment. Includes 8 hours of free access to the full-bodied functionality of Spotfire Desktop and Drill Explorer. Shows how Apache Drill helps you query complex data and discover schemas on-the fly. Helps you discover business insights and create exceptional dashboards with Spotfire. Provides sample JSON datasets with a free how-to video to guide you. Provides a fully functional, 3-node Hadoop cluster with a Spotfire desktop that is fully configured with Apache Drill. Sign up now, it’s an easy, no-obligation way to discover the power of Apache Drill and Spotfire as a service.